The University of Plymouth Students’ Union (UPSU) has participated in the 17th national Student Volunteering Week, during which students and staff across the UK come together to celebrate the incredible impact student volunteers have in their local communities. To kick off the week, the Students’ Union hosted its first ever Micro-volunteering fair which showcased just a few of the volunteering opportunities available to students and included organisations as diverse as the Marine Conservation Society, Macmillan Cancer Research, National Autistic Society and Active Neighbourhoods. And students also took part in a wide range of community volunteering activities throughout the week. This included 55 students going out in volunteering groups, contributing over 335 volunteering hours to community groups such as Plymouth and District Special Olympics, Devon and Cornwall Rail Partnership, Dartmoor Zoo, Natural England, Moor Trees and the Barn Owl Trust. The student Raise and Give (RAG) team raised over £400 at their annual pizza eating contest during the week. Students also set off for their annual Jailbreak and within 36 hours had teams reaching Lanzarote, Paris and Caen in France, Glasgow and John O’Groats and raising more than £1,000 for RAG’s three nominated charities – Student Minds, Macmillan Cancer Support and the National Autistic Society. Every year University of Plymouth students contribute more than 25,000 hours of volunteering in the local and wider community and last year raised over £240,000 for charity. The Community and Representation Pop Up Awards at the end of the week celebrated students who have contributed as many as 50, 100 and 200 hours of volunteering in the community. 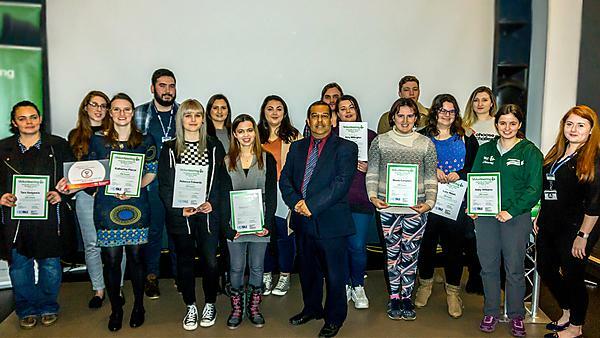 The awards were presented by Professor Julian Chaudhuri, Deputy Vice-Chancellor (Education and Student Experience). Throughout Student Volunteering Week 2018, the University of Plymouth Students’ Union shared via its social media channels words from current and former University students, trustees and our community partners.